The latest version of Visual Studio 2017 adds the ability to insert selection points to multiple places of your code file, so that, you can start typing the same code in all those caret positions. You are also allowed to select the next matching selection in a document. When a selection is already there, press [ Shift + Alt + . (dot) ] to add the next matching selections one by one. This helps you to verify the context of each additional selection. If you would like to skip over a match, you can press [ Ctrl + Alt + Shift + . (dot) ] to move the last matching selection to the next instance. Liked the post? Don't forget to share it with your friends and colleagues. This will help them to complete their job smoothly and efficiently. Also, don't forget to read out my other posts on Visual Studio Productivity Tips. Who knows those could be beneficial too. 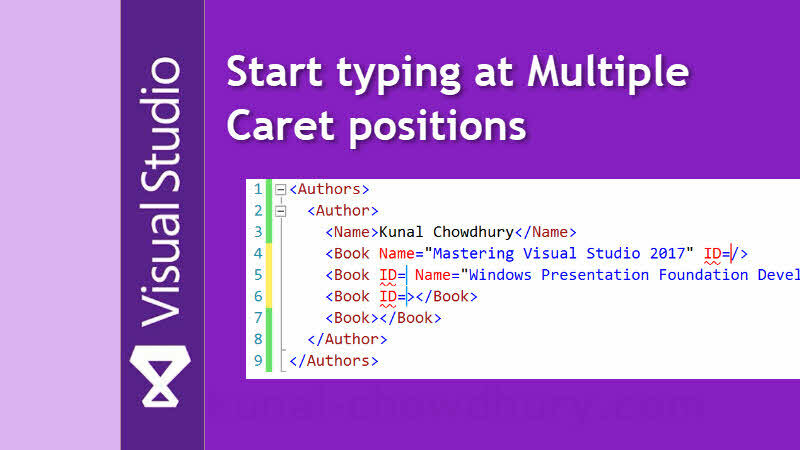 If you have come this far, it means that you liked what you are reading (Visual Studio Productivity Tips: Adding and deleting text at multiple caret positions).